It’s two for the price of one on Saturday 28 April as Malvern Male Voice Choir is joined in concert by the celebrated 50-strong Launceston Male Voice Choir from Cornwall. This special gala event, which is being staged at Great Malvern Priory, starts at 7.30 pm. 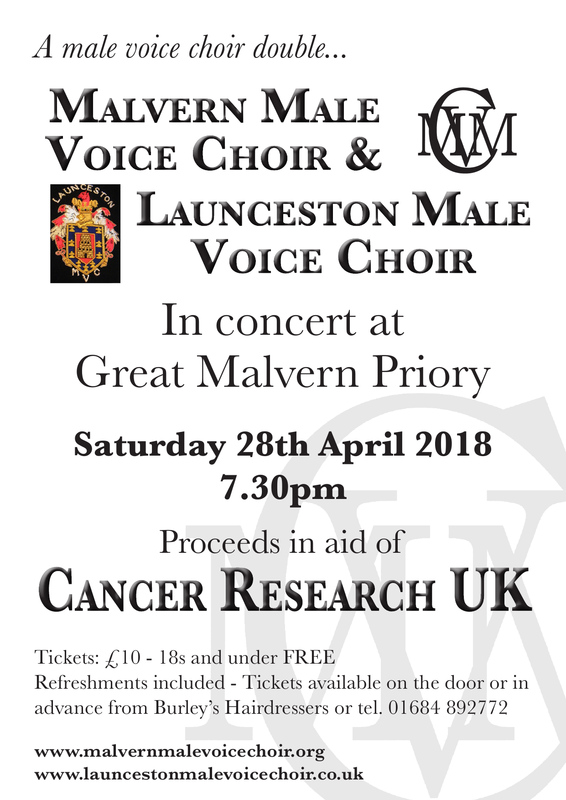 The concert is in aid of Cancer Research UK, a charity that Malvern Male Voice Choir supports every year; an earlier concert in support of this charity had to be cancelled due to snow in March. Expect a packed and varied programme in aid of a very good cause with music from three continents that includes Welsh male voice choir standards, a short medley from Les Miserables, other showstoppers from stage and screen and a few pop favourites. Tickets cost only £10 (18s & under FREE) and can be bought in advance from Burley’s Hairdressers or by phoning 01684 892772. Tickets, which include light refreshments, will also available on the door.